This elegiac and undeniably slightly reactionary passage strikes a chord with me. One of the first digs I worked on was the Anglo-Saxon site at West Heslerton. It was the summer of 1989 and as we revealed the remains of an rural settlement dating to the 6th century American A10 Tankbusters flew low overhead warming up for the first Gulf War. In the evenings we’d sometimes walk up to the top of the scarp slope of the Yorkshire Wolds and drink and smoke whilst looking at the landscape laid out in front of us. To our left lay Ryedale with its many early medieval monasteries, directly opposite were the southern slopes of the North York Moors, whilst in the distance to our right was the Mesolithic site of Star Carr. Occasionally, this idyll would be disturbed as warplane streaked across the sky practising night flights. Many of my subsequent digging experiences have been juxtaposed with signs of warfare and conflict. Jet fighters screamed above us when sieving on the site of the castle of Dolforwyn in Montgomeryshire in 1992; military police stopped to investigate what we were up to when fieldwalking next to the army camp at Catterick in 1994. In 1996 I dug on the Roman fort at Pevensey in the shadow of a pillbox of 1941 vintage. In four years working in the North East I regularly sped passed convoys of army vehicles heading north to Catterick after peacekeeping duties in the Balkans or moving up to Otterburn for exercises. Hoskin’s approach to the study of landscape was Romantic and his work is paralleled artistically in the Neo-Romantic movement. This movement has its origins in the late 19th century and early 20th century in the work of William Morris, Samuel Palmer and such under-appreciated writers as Richard Jefferies. 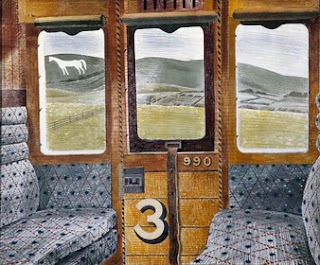 However, it flowered particularly in the 1930s-50s in the art of John Minton and Eric Ravilious, the films of Powell and Pressburger and Humphrey Jennings and the music of Arnold Bax and Benjamin Britten. This late blooming was undoubtedly stimulated by the impending threat of industrialised warfare and the massive change in rural life that were taking place following WWI; George Orwell wrote about both these threats in his novel Coming Up for Air (1939). Whilst not normally seen as a Neo-Romantic in this little gem Orwell clearly engaged with the concerns of many other artists in the tense years of the late 1930s after Guernica and before Dunkirk. It was the work of later artists in the Neo-Romantic tradition, including authors such as Alan Garner, Keith Roberts, and artists including Andy Goldsworthy , Clifford Harper and the Brotherhood of Ruralists, whose work I first encountered as teenager (in the case of the work of the Brotherhood of Ruralists on the cover of the Arden Edition Shakespeare’s I used at O level and A level) that stimulated and has continued to fire my own academic and creative engagement with the past and the English landscape, as much as childhood visits to castles and churches.